The most memorable image from this weekend’s League of Legends world championships wasn’t of the winner’s podium, the trophy, the stadium, or even the freaking dragon in the arena. 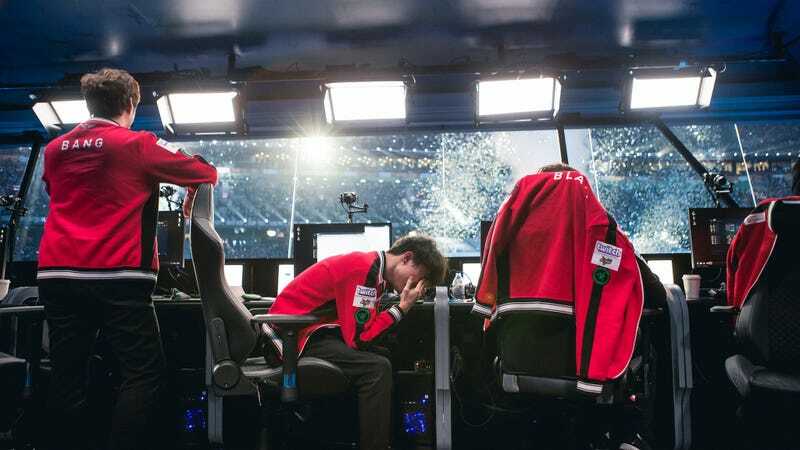 It was of Lee “Faker” Sang-hyeok, a godlike figure in League of Legends, brought to tears after a crushing 3-0 loss. Faker is one of the most recognizable names in esports, and for good reason—he’s widely considered the best League of Legends player in the world, meriting a massive ESPN profile two years ago. One of his nicknames is literally “God.” But this year’s world championships brought Faker down, denied a fourth world championship at the hands of last year’s runner-up, a team which, like Faker’s*, is named for a South Korean electronics conglomerate. When the broadcast camera zoomed in on a weeping Faker, broken down moments after a crushing defeat, there was some debate as to whether his devastation should be highlighted at all. It should! A moment where a legend is bent over, crying over losing something he’d come so close to achieving, is human and emotive, representative of a player beyond just their talent and skill. Seeing stars exposed at the lowest, most brutal moments of their professional careers is more than standard in major American sports—it’s part of the appeal for way more people than are willing to admit it. When esports players begin getting recognized as people with blood pumping through their veins and not cyber-humans is when they become household names. Emotion is good for the growth of esports, even if it hurts to watch. Like Punk at Evo or LeBron in the NBA Finals, seeing the bottom sets the stage for the climb back to the top. It’s moments like Faker’s tears that elevate competition beyond the keystrokes and mouse-clicks. They’re not just worth seeing, but vital.